Let's Go Deep — Annamieka: Artist. Let's Bring Your World to Life. I’m Going Deep This Year—Join Me! This new offering is all about getting to the core of your own creative work, inventing an art practice that is truly your own, and producing a cohesive body of work. I will lead from my lifetime of experience as a visual artist but don’t be mistaken; I am not the one with all the answers. YOU have access to everything you need to know inside of you. This is about your own collaboration with creativity itself. Private 1-on-1 mentoring and deep-dive creative day if you choose the Full Focus level of participation. A: Now! The next session of Let’s Go Deep is scheduled to begin in September 2019 and run through May 2020, but you can register today. Scroll down to learn more about registration options. Let's Go Deep: Create a Cohesive Body of Work that is truly YOURS. Where do you want to be, one year from now, with your creative work? Let's make it happen for you. Let's Go Deep. Our monthly lessons will generally be on the First Wednesday of every month at 12pm PST, with a few exceptions, you can see the dates on the FAQ page. During these calls, hosted on the Zoom video platform, I talk through the month’s lesson as a whole, and then open it up to discussion at the end for whoever is attending live. I encourage you to attend live if at all possible, but if you’re not able to attend, that’s OK. The call recording will be posted in the online classroom within 24 hours after the call, so you can watch it, or listen podcast style, audio only at your convenience. 1-on-1 session via video conference during the early part of our year to create an individualized plan for working through the program to make sure your needs are met. 1-on-1 session via video conference. You'll have my eyes on your work all year but this is our moment to really celebrate and go in-depth in a 1-on-1 session. This will be scheduled near the end of our program year. You'll get my perspectives on your new work, within the context of your year of growth, to help you clarify your own style and voice at this powerful time in your career! 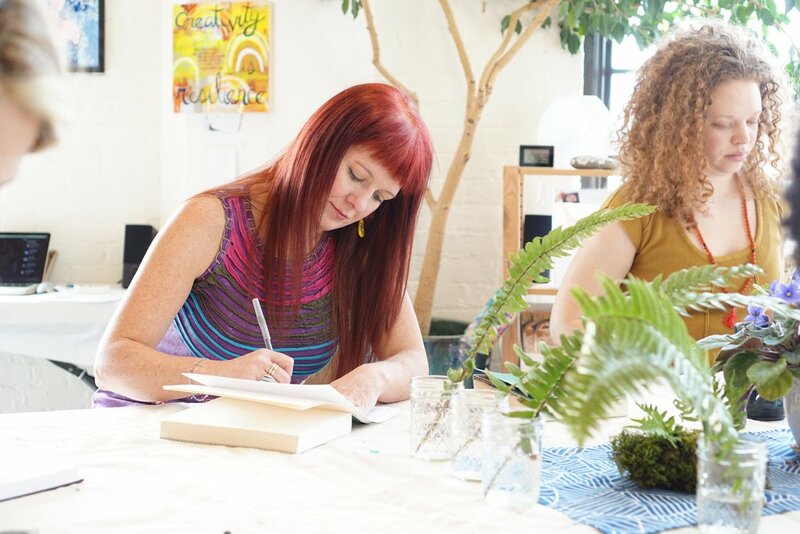 FULL FOCUS: This level is perfect for you if you know that you need extra, highly-individualized support to really take your art practice to the next level - and you're ready to thrive. 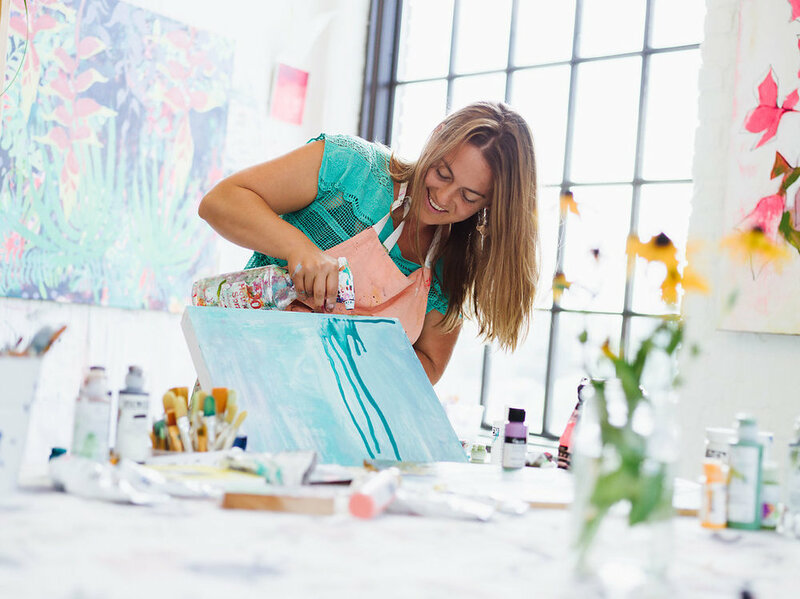 Our 9 calls allow you to get on-going highly focused hands-on time with me to really tailor the teachings to your art practice and to make consistent progress on your goals. 6 hours 1-on-1 - can be done in-person in my Portland, Oregon studio, or virtually via Zoom video conferencing. In this immersive 1:1 intensive you'll have the opportunity to work through a creative project with me from start to finish - such as designing a solo show, planning an event, fine-tuning your website or artist statement, designing commission packages or teaching offerings. This is hands-on support for the next big step that you want to take with your cohesive body of work. One year from now, you could have a strong, cohesive body of work, and an art practice that fits like your favorite jacket. Powerful & truly YOU. Now tell me, what's that worth to you? Let's make it happen! Thank you and I can hardly freaking wait to go deep with you! PS: Read the Let's Go Deep: Frequently Asked Questions page! It will help!